Rostock (Germany), November 2018 - Yilport Holding aims to create excellent, multipurpose facilities on an international scale. At the beginning of November, two Liebherr mobile harbour cranes type LHM 600 arrived at Yilport’s recently acquired terminal in Guatemala. An option on two more LHM 600 underlines the forthcoming strategic partnership between Liebherr and Yilport. Yilport Holding is a subsidiary of Yildrim Group and was established in 2011 to consolidate port and container terminals on an international level. Yilport globally operates 21 marine ports and terminals and 6 dry terminals. The latest member of Yilport’s terminal portfolio is Guatemala’s largest Pacific Ocean port Puerto Quetzal. Puerto Quetzal, located 102 kilometres from Guatemala City, is able to accommodate vessels up to Panamax size. Yilport has already invested in new equipment to cope with the expected growth in freight volumes in Quetzal. At the beginning of October, two Liebherr mobile harbour cranes type LHM 600 were delivered from Liebherr’s maritime production facility in Rostock, Germany. The machines are equipped with a tower extension of 12 metres, which ensures a maximum cabin height of more than 37 meters. The higher position of the operator cabin ensures high visibility into deep cargo holds and enables highly efficient container handling with maximum safety. With a maximum outreach of 58 metres, twin lift capability and a lifting capacity of 104 tonnes, the LHM 600 is capable of servicing vessels up to 19 container rows wide and nine container stacks high. “These new machines are an essential future investment in Yilports terminal in order to handle the new generation of vessels. Liebherr is looking forward to a cooperative and strategic partnership with the Yildrim Group. We are delighted that Yilport Holding trusts in our reliable cranes. Looking ahead to projects in the pipeline for the coming year, it is clear that we will continue to expand this partnership,” quotes Andreas Müller, Sales Director of Mobile Harbour Cranes. 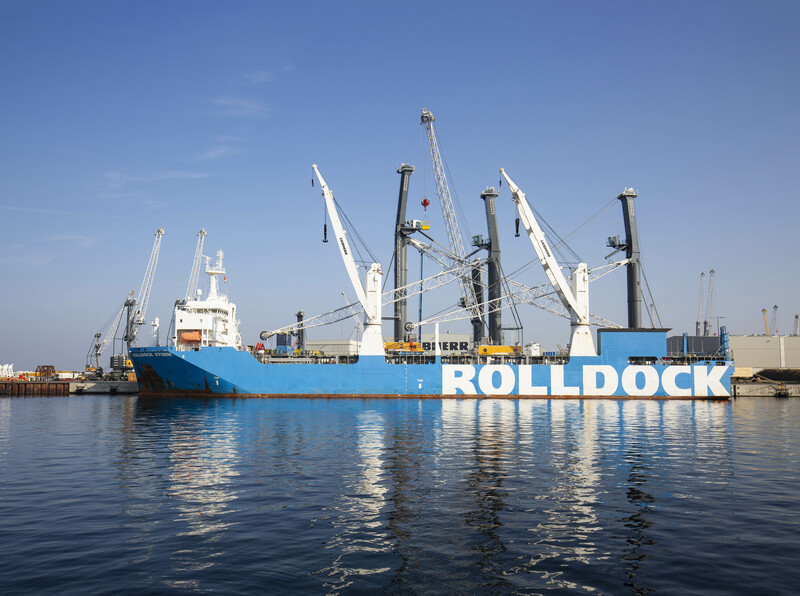 Both cranes were shipped fully erected from Germany to Guatemala by the Ro-Ro vessel “Rolldock Storm”. Located at the Baltic Sea Liebherr Rostock provides the best conditions for fast and effective shipment of large maritime cargo handling solutions. Shipping fully assembled Liebherr cranes by Ro-Ro vessel means that the machines can be ready for operation shortly after driving off the vessel onto the quay. Both cranes will be ready for operation by the end of November. Yilport Holding has an option for two more machines in 2019.